Your baby is continuing to gain weight with every week of your pregnancy, despite being so near the end and regardless of how little space you might feel you have left inside to accommodate them! This week, your baby may have reached a weight of as much as 3kg, but they have probably not gained in length since last week. Your baby's bowels will now have accumulated a fair amount of meconium. This is the build up of waste that will form their first bowel movement. You might be three weeks away from your expected due date but in actual fact, if your baby arrives at any time from now, then the delivery will no longer be considered premature. Pregnancies are considered to be full term by 37 weeks. 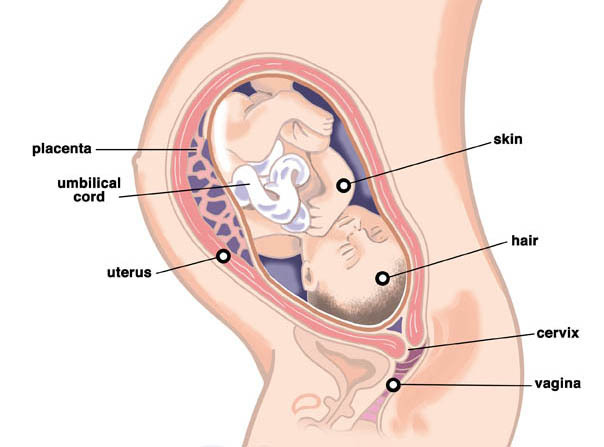 You may find that the baby's movements seem to have lessened over recent weeks. You should still be able to feel movement at various times in the day, but these movements probably feel less powerful now as it is likely that they are the result of twisting and wriggling, rather than kicking and punching. This is because there is much less space in the uterus for swinging fists and feet these days. If you are worried about the lack of movement from the baby then there are ways that you can check for activity. One way is to sit or lie still and take a note of the time. Count any little movements that you feel, no matter how tiny, and make a note of the time when you have counted ten movements. Ideally you should feel ten movements within ten minutes, but if not, don't worry. Get up, have something to eat and drink and take a little walk, it is likely that the baby was in a period of deep sleep, by this stage their sleep patterns are very close to that of a newborn baby's. If you don't manage to detect ten movements in the space of two hours then it is wise to call your midwife or GP, but don't panic. It is sensible to get to the clinic or hospital quickly to check that all is OK, but the reduction in activity doesn't necessarily mean that there is a problem. If you are feeling anxious about the impending delivery then go over your birth plan and remind yourself of your preferences, make sure that your partner knows all of these so that they can speak for you if necessary (sometimes chat can be a little difficult during labour!). It is also important to keep an open mind. Remember that nobody has a crystal ball when it comes to delivering a baby and there are lots of reasons why things might not go exactly to your dream plan. There is always the potential for medical staff to make last minute decisions in the interest of the safety of both you and the baby; it is also possible that you need a great deal more, or less, pain relief than you anticipated. Remember that the ultimate goal here is to have your baby safely in your arms, and once you reach that stage and get to meet them for the first time, you probably won't be giving a second thought to how they arrived. Page generated in 1.3225 seconds.